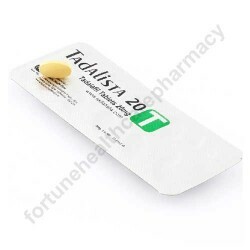 Weekend pill, Tadalista 20 manufactured by Fortune Health Care Ltd treats erectile dysfunction in impotent men. Power-packed pill is known for fascinating effectiveness on men. Medicine works in minutes with effectiveness that lasts for hours together. Main active component Tadalafil 20 mg (Generic Cialis) in the medicine performs by blocking PDE-5 enzyme. This enzyme belongs to prolongs nerve signal that causes an erection. Boost up in blood flow helps men to attain and maintain erection for longer time. Take this medicine along with water once in a couple of day. Medicine is to be consumed as whole without chewing or crushing to gain maximum effective outcome. Proper consumption of this medication Tadalista 20 helps men to stay active for maximum 36 hours. Powerful medicine composed Tadalafil 20 mg (Generic Cialis) does show up side effects that are severe. 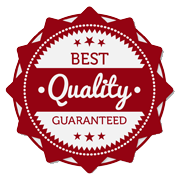 On the other hand some mild and common side effects with this high powered pill include stuffy nose, sneezing, sore throat, headache, diarrhea, upset stomach and muscle pain.